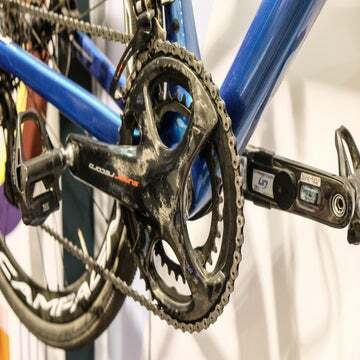 Lennard Zinn explains how a finish-line camera really works after a viewer sees something weird in Tour de France TV coverage. Thank you for your article on Coke can shims for seat post slippage. Some of your readers must love the idea of the Coke shim, like I do, while other do not like it at all! 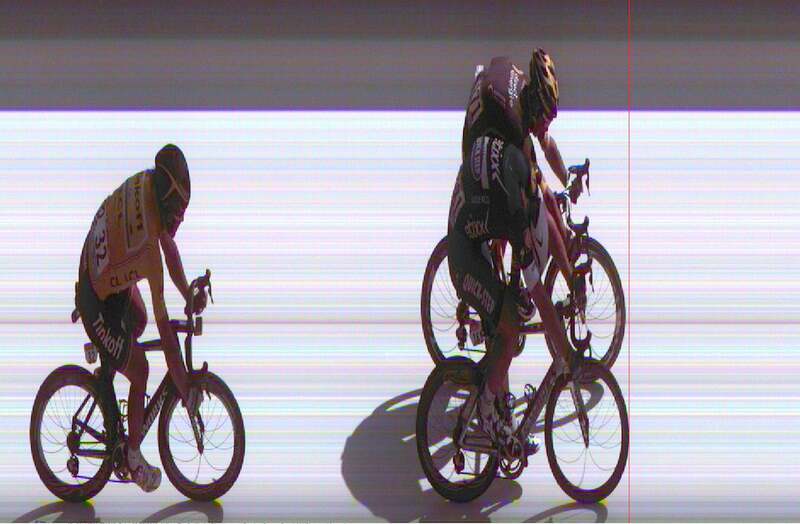 Here’s my question: Why are the wheel spokes on a photo finish curved; see attached from stage 3, Tour de France 2016? 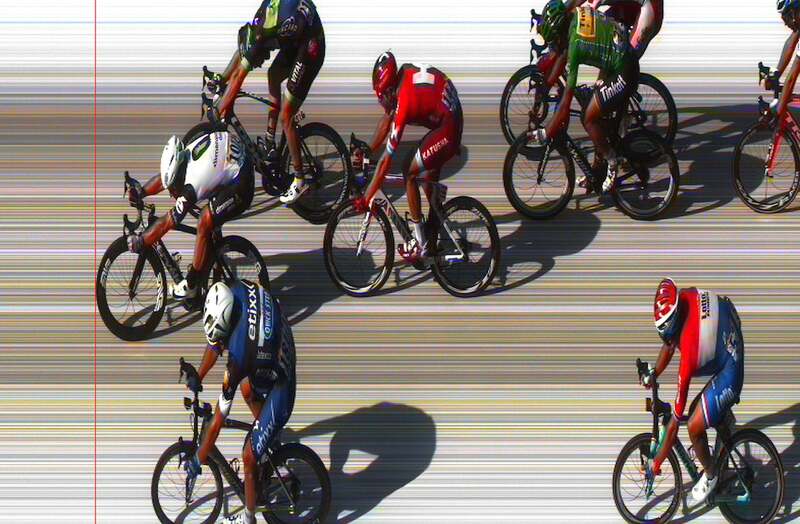 The curving of the spokes in a photo-finish image is due to the fact that the camera is catching a single image, not a bunch of images taken at high shutter speed, when each rider crosses the line. There is no need for high-speed data storage or a really fast lens to capture the entire finish. That’s why Peter Sagan could get the image so quickly on his smartphone on Monday (stage 16) and see that he’d beaten Alexander Kristoff in Bern. The assumption people make when looking at a photo finish is that it is a normal photo, which has distorted images. After all, the bikes themselves, other than the spokes, look pretty normal — but the riders indeed look weird! But if it were a normal photo, there would be a background, and there is not, because the film is moving with the riders, whereas the background is stationary. This means there is no actual finish line to be seen in the photo, because the finish line is stationary — the entire photo is the finish line. Do you ever wonder why the finish line in photo finishes is often shown as a thin red line, whereas the actual finish was two wide, white stripes with a narrow, black stripe in between? Maybe you thought the red line was just for emphasis because the finish line was blurry? No, the red line is a tool that can be moved by the computer across the screen, and the finish line is that entire white or grey smear from one edge of the photo to the other. That red line is moved past the riders in the image to check the relative positions of the third- and fourth-placed riders. But third and fourth can’t have yet reached the line, since they just showed the red line lined up with the tire of the first-place rider, right? If it was a normal photo, you might think the fourth-place rider could pass third place by the time they reach the line. But the entire image was taken at the line; fourth is fourth and third is third. Officials move that red line around to look at the positions of riders further back relative to each other, because they are all photographed as they crossed the finish line. Since the camera aperture is a vertical slit lined up with the finish, every one of those images of riders does indeed show them as they crossed the finish line. They look to be behind the riders ahead of them in space, but you are actually looking at the moment they crossed the line, behind the riders ahead. And if you know exactly how fast the film was moving when it was taken and the scale of the photo, you can actually measure the time gaps between riders with a ruler. Okay, so back to your question about the curved spoke effect. First of all, you have to understand that parts that are moving faster than the film will be compressed horizontally, while parts moving slower than the film will be stretched horizontally. Obvious, right? Faster-moving objects move past the slit aperture quicker than do slower-moving ones, so they are exposed on the film for less time and thus fill less horizontal space on the image. Furthermore, the spoke at the bottom of the wheel is stationary since the wheel does not slip on the ground, right? So since that spoke is stopped at the instant it passes bottom, dead center, it will get the most curvature, because as the film moves past, that spoke stays in the aperture for a longer period of time as it then moves further along around the wheel, thus appearing on the film for a longer period. The faster-moving spokes at the top are curved less, because they are moving faster and get past the aperture slit more quickly; their position over time on the photo is thus compressed horizontally because they have been in the light exposing the film for less time. You can’t see the curved-spoke effect as well with modern wheels, as you could 35 years ago when we were racing on 36-spoke wheels. 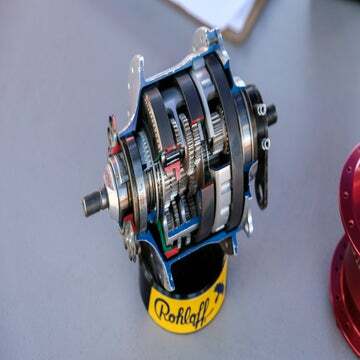 For instance, when I was racing the Coors Classic in 1981, I remember looking at a photo-finish image in the newspaper from one of the criteriums for hours; the spokes were so numerous that the dramatic curving of the bottom spokes compared to the ones at the top of the wheel was stunning. That’s harder to see in this photo. This stage 4 photo finish between Marcel Kittel and Bryan Coquard shows a bit more of this effect on Coquard’s rear wheel; perhaps he has more spokes than Kittel. See how the spokes higher up on the wheel are curved less than those nearer the bottom? The distortion of body parts is also due to faster-moving objects being squashed horizontally, and slower-moving ones being stretched. Notice how Cavendish’s left calf appears thinner, or as thin, as his forearms. I don’t believe he is actually built this way. The illusion is because the forearms are moving slower than the left foot. The forearms move at the speed of the bike, which is the approximate speed that the film is moving past the slip aperture. 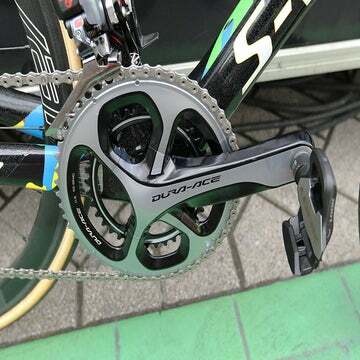 The top foot, however, which is attached to the top pedal, is moving faster than the bike, so it gets past the slit aperture faster and thus is squashed horizontally more than the forearms. The finish-photo technicians adjust the speed of the camera “film” to match the estimated finish speed of the riders, and, if they hit it right, the bikes at least should look fairly normal. This is why riders from a breakaway who are caught at the line look so much more stretched out than those sprinting past them; they are going slower than the “film” is.